Sep. 19, 2018: Marilynn Wood Hill and Robert M. Riggs were honored at the annual Bronxville Women’s Club gala on Sunday, September 16, 2018, for their many years of service to the Bronxville community, foremost among them as co-founders of The Bronxville Historical Conservancy. 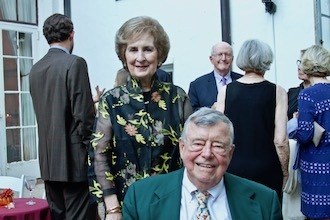 Over 150 guests attended the dinner in the ballroom of the historic 1920s clubhouse on the corner of Midland and Tanglewylde Avenues to see Hill and Riggs receive the Distinguished Community Service Award presented to them by club president Mary Westmoreland and members of The Bronxville Women’s Club. Mary Ella Crane served as the chair of the gala. Marilynn and her husband, John, moved to Bronxville with their two daughters in 1976. A resident of Bronxville for nearly forty years now, Dr. Hill has spent most of her career studying and researching American history, especially in Westchester County and New York City. She was the first chair of the Bronxville Board of Ethics; chair of the Bronxville Adult School; and a co-founder (and is life co-chair) of The Bronxville Historical Conservancy, where she is the editor of The Bronxville Journal, the conservancy's publication. 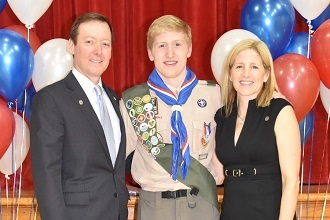 Bob, a native of Bronxville, grew up in the oldest house in Bronxville and graduated from Bronxville High School. After earning a bachelor's degree from Amherst College and a law degree from Columbia Law School, Bob served as a B-47 pilot. He returned to Bronxville with his wife, Wendy, to raise their two daughters. Among his many civic endeavors, Bob served as Bronxville Village counsel and as a Bronxville Village trustee. In commemorating the two honorees, club president Mary Westmoreland wrote in the booklet: "The two people that we are honoring tonight are deeply embedded in the Community and have devoted their life to preserving and protecting our local legacy. We are so fortunate to have among us such expertise. Expertise that they have voluntarily shared with all of us by documenting our past through The Bronxville Historical Conservancy, writing for the BWC Villager, or through their steadfast commitment to our history." Pictured here: Honorees Marilynn Wood Hill and Robert M. Riggs.